This is basically an update from my Components and Sampling post a few weeks ago (1-Oct-2018). Little bits of this and that, hopefully not signifying nothing. I’ve decided to go with what’s exciting me most first, rather than chronological. The Anni Albers book (20-Oct-2018) has me buzzing. I had to put the book down and get something into my hands. How’s this for a potential component? This was done off-loom, held in my hands for ultimate flexibility. That worked quite well for the twined sections, but the leno got a bit wild. The detail shot below is on a 1 cm grid, to give an idea of scale. Most of the wire is 28 gauge, with a heavier wire used in the header and the actual cross of the leno. Yesterday for the first time in a long time, I dressed a loom. Well… I’m using the 4 shaft Robinson loom as a frame, not involving a reed or shafts, not putting great tension on the 28 gauge wire. 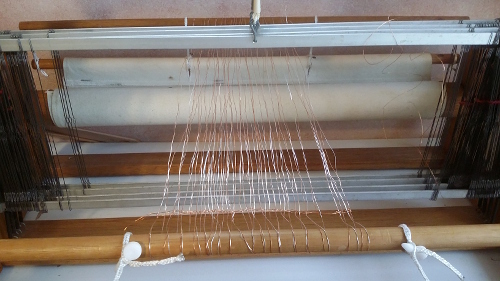 So far the wire is looped on (a variant of a technique I saw long ago on quick dressing a rigid heddle loom), and held in order with a couple of rows of twining at each end. I carried two wires together, bare copper and silver-coated, with ideas of some colour and weave experimenting. The plan is to do everything using pick-up techniques. Can I get the structure, the variation and interest I want, with tension sufficient to help me working and keep from tangles while loose enough to keep it dynamic and flowing? It’s on a brief pause at the moment while I make space on my work table, to move the loom from the side bench which doesn’t have great light (there used to be enough there, but something’s changed over the years 🙂 ). The red is 12 gauge aluminium from Apack. The heavier brass colour 20 gauge (anonymous, from the stash). The finer one is actually brass, 0.5 mm (about 24 gauge), A&E metals. The fine “silver” is 28 gauge coated copper wire from Over the Rainbow (polymerclay.com.au/). 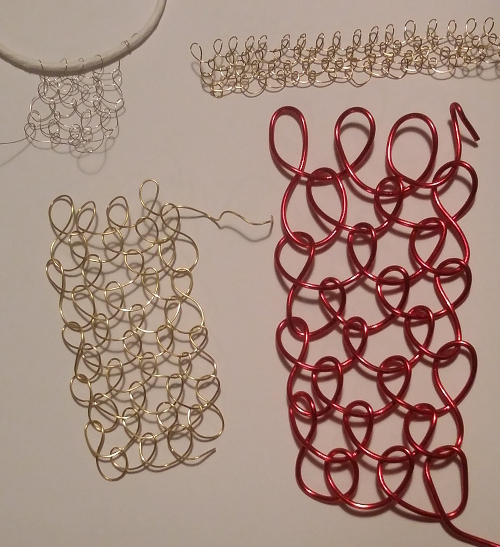 All of these were very easy to use, with no complaints from the joints (although keeping in mind these are small samples, each using one wingspan of wire). 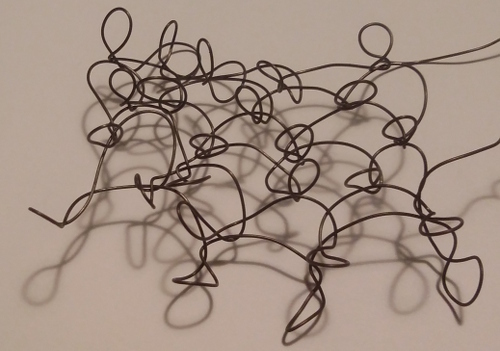 The resulting “fabric” is quite easy to form and manipulate, and holds shape well in most directions. Beautiful, bouncy, like unintelligible handwriting. In fact this is looping, with each loop upwards pulled through a little, twisted and bent 90 degrees to make it thoroughly three dimensional. The wire is 24 gauge “black reel wire” from Apack. I think it’s annealed steel (from the person who told me about the supplier), but can’t be sure. No signs of rust. Soft and easy to use. The fabric created holds shape very well, and all those projecting loops look full of potential for building further or embellishing. 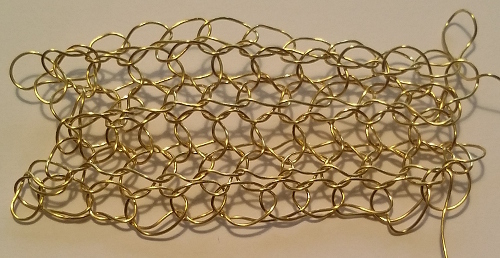 This is more of the 0.5 mm brass, using crochet. It’s a denser fabric. There’s a sort of dimensional corrugation with the rows worked back and forward, but overall it looks a little heavy and stable – not dynamic and lively. The killer is that I got some thumb joint pain even in this small piece. Not something I’m likely return to – certainly not with this gauge wire. The beginning of some twining, working in 28 gauge wire. 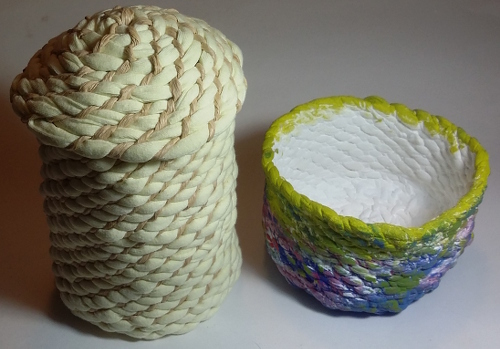 In structure and in technique (the thumb flip) just what Mary Hettmansperger taught using waxed linen (17-Sep-2018). This is much more open, and of course holds shape well without reinforcement with mod podge. It’s meant to be semi-mindless work to cope with TV-watching (I’m no good with tension – if the music changes to a buildup, I dutifully get scared). However I’m finding it a little fine for that – I need good light (hmm… a connection with earlier comments???). The first of these little pots was seen 1-Oct-2018. My technique has definitely improved with the second, larger pot. The lid is domed because I made it a bit big 🙂 . It’s been languishing a few weeks now. I’m hoping the alteration of proportions will let me do more of a slice down the height of the inspiration painting. Pretty much on a whim, I recently bought The Art of the Fold: How to make innovative books and paper structures by Hedi Kyle and Ulla Warchol. I have lots of paper around, sketches and prints and experiments that have piled up. Perhaps I could fold them, transform them into something more satisfactory. Lovely book – good instructions and diagrams, techniques and structures that get reused, elaborated, extended, as the projects progress. Lots of great inspiration photographs. My first attempt (apart from familiarisation bits on plain paper): a pocket accordion with separate cover. So small and pretty! About 10 cm high, 5.5 or so wide. Very satisfying. While not apparent to others, I particularly like the refreshing and encapsulating of memories. The cover is leftovers from a class with Adele Outteridge (25-Jul-2014). The inside pages are from a large sheet of cartridge paper. I went back through months of photos to identify it – from a printmaking session back in 2016 (24-Jul-2016). That detective side excursion on a side excursion was a pleasure and revelation in itself – so many exhibitions, and travels, and classes, and so, so much making! Even the little inserts capture memory. I don’t know if you can see in the photo the inserts are paint cards, and one colour has been selected for the bathroom wall – but not my bathroom. In a class with Keith Lo Bue last year (23-Apr-2017), there was an exercise where we each put three things we’d brought onto a table, and we each selected three things from other people to use as raw material. My final choice, with not much left on the table – the rather uninspiring paint cards. A fairly random moment resurfaced, memorialised, made special. I blinked and time has passed! I’m afraid this post will be a rough-and-ready mix, catching up. The major focus has been finding appropriate residential care for my mother-in-law. She had a rotten year with several long hospital stays – returning to her own home was not an option. She’s now close by getting the care she needs, and while not happy she is making an effort to accept what became inevitable. I feel lucky to live in Australia where aged care is heavily government regulated – complex and hard to navigate, but available (eventually), good quality and affordable. MASTERPIECES from PARIS – wonderful artworks which transcended the crowds and queueing. The season has been extended to 18 April, but make sure you pre-purchase tickets and be prepared to be patient. If you have children, there is a wonderful room of activities available inside the exhibition as well as a child-friendly audio tour. The March ATASDA NSW meeting was fun. The Maharajah’s Garden pieces were all there, though difficult to see in the crush of people. I bought these “weaving sticks” from another member. The warp yarn is threaded through the base of the sticks (see insert top left of the photo), the sticks provide a rigid form to wind the weft around, and as the sticks are covered you push the weft down over the warp. This is one of the warps I dyed in Linda Coffill’s class in January. It’s 20/2 silk sett at 40 epi. 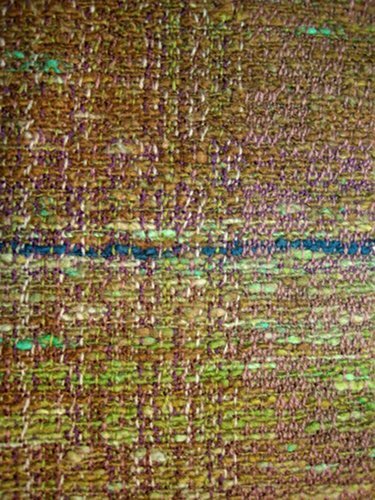 Weft is 60/2 silk. Plain weave, with warp dominant but weft still visible. The result has a lovely drape, hand and shine. I’m really happy with it. One interesting thing is the impact of the weft colour. 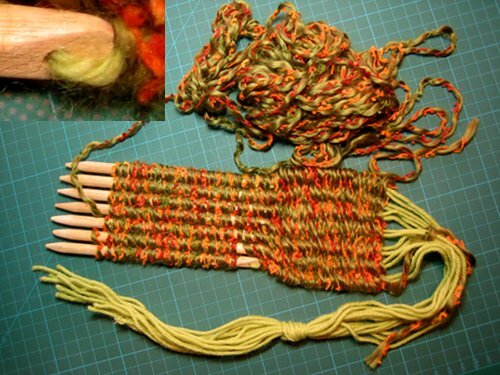 It was dyed coral, the same as parts of the warp. 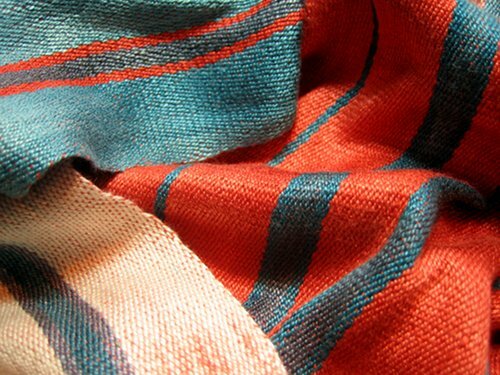 The little dots of the weft showing intensify the colour where the warp is also coral. They dull the blue areas, and particularly the lighter greenish-blue. Overall the balance of colour is not what I planned. I don’t mind the result, but it’s definitely something to keep in mind in the future. Another spin-off from Linda’s class was the formation of a new colour study group within the Guild. We’ve started meeting once a month in the Guild rooms – other members are welcome (we’re not meeting in April due Easter and holidays). At our first meeting we had lots of show and tell and talked about what we want to do. At our second, we brought dyed fibres, a couple of people brought their drum carders, and we played with colour blending. I experimented with blending the same colours (not necessarily the same proportions), creating rolags using hand carders and a layered bat in the drum carder. I spun the results without plying, but was very rough when finishing the yarn so that it would felt up and not cause too many shrinkage problems when weaving. 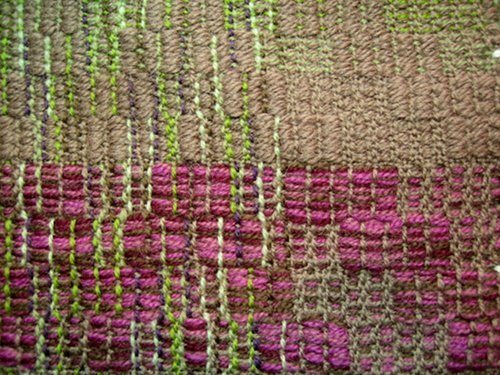 It became weft in part of my latest weaving class sampler – crackle. The section above the dividing line was the drum carded part – texturally more evenly mixed and the brown dominant (it was the outside layers of the sandwich). The lower part was the handcarded rolags. Lots of variation and interest. I really like that section. I’m not going to attempt an explanation of crackle here. 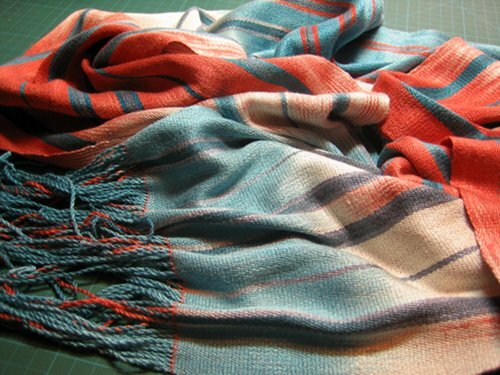 There’s lots of information available – Peg has a huge amount in her blog, and there are heaps of articles on handweaving.net. This is another section of the same sampler. The right third of the warp was plain brown, threaded to show each of the 4 blocks. The left side was a fairly random mix of 6 colours in the warp, and the threading jumped around between blocks. I did quite a bit of playing with different pattern and tabby wefts. Lots of potential to return to another day. June to September was tricky time-wise for me, and for a couple of months the looms were empty. However it wasn’t totally without weaving. This little treasure pouch is about 9 x 15 cm (say 3.5 x 6 inches). It was made on a piece of cardboard with some notches cut in to hold the warp, using instructions in Kids Weaving by Sarah Swett (on Amazon here). Rather than using a yarn needle to weave in the weft, I wrapped some tape around the end of the yarn to stiffen it and just used my fingers. I took the pouch and a bag of supplies to a family lunch as an activity for my nieces and nephews, but the cousins were having so much fun running around together that we didn’t get to it. Perhaps another day – one in particular I think might enjoy it, though the others might find it a bit slow. The second off-loom project was really more felting – but still with a weaving element so I’m counting it! I needed to send some thank you cards. I used some merino wool top that I dyed and carded a year or two back. Each colour fibre was laid out separately and made into sheets of pre-felt (meaning the fibres are lightly tangled/felted so it holds together, but there’s still a lot of shrinkage and toughening up to go). Then I cut up each sheet into strips, and it was like weaving with paper in primary school. 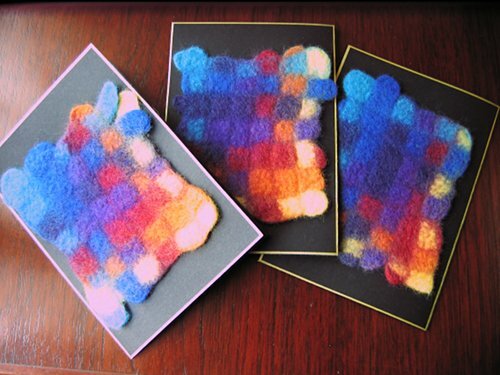 Finally I carefully finished felting each woven square – you can see some bits went a bit haywire. The cards went to thank fibre-y folk who had donated prizes for an ATASDA raffle. Diane Groenewegen is a very accomplished textile artist (her ATASDA member gallery page is here), and when I visited her studio on an open-day my card was pinned up on display (reflected glory!). 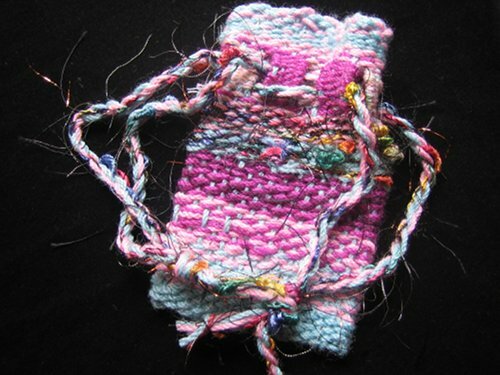 Another recipient of my little cards was Beatrice Jackson, also an ATASDA member and a wonderful weaver – Beatrice and some of her work can be seen here. ATASDA is lucky to have members who are not only incredibly gifted in their own work, but also willing to support the group plus encourage relative newbies like me.